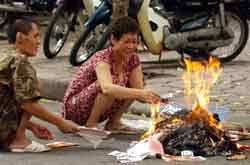 VietNamNet Bridge – Producers of ‘ghost money' used in the burning of votive offerings will not be allowed to use the content, image, patterns and colours of real Vietnamese and foreign currencies for their products following a draft regulation issued by the Ha Noi Department of Information and Communications. Under the draft regulation, all votive money printing establishments in the city must have business registration certificates and will be required to register samples and kinds of votive money they plan to print. The sizes of votive money must be 3cm shorter or longer than real bank notes and producers are required to print votive money in one colour and only on one side of the paper. Printing establishments will also be required to print their addresses on votive papers. Department's Deputy Director Duong Ky Lan said the regulation was drafted as the lack of regulations and punishments made it difficult to manage the print, production and trading of votive papers. "The current regulations lack detailed guidance and remain unspecific. For example, it is difficult for information and telecommunications inspectors to punish businesses, as it is not easy to define what kind of votive paper is allowed for printing while the granting of license for votive money printing has yet been widely applied," he said. It was clear that votive money that resembled real currency still existed for sale, he added. "Therefore, the department is mapping out a draft document in order to create more effective management tools for inspectors and authorised agencies to keep the print and trade of votive papers under better control," he said. The draft is expected to be completed by the end of this week to be submitted to the municipal People's Committee for approval. "If the regulations are approved, detailed guidance will be issued and information dissemination will be strengthened to raise awareness among both producers and customers," Lan added. Last year, the State Bank of Viet Nam proposed the Ministry of Information and Communications to require all departments of Information and Telecommunications nationwide to ban the use of designs resembling existing Vietnamese bank notes during the print approval process.